The theme of this research group can be divided into two parts with a common aim of biological applications and support the progress of each other. 1) Surface and Interface Sciences: using self-assembled monolayers with mixed functional groups, interfacial properties can be tailored for studying the interaction between biological species and surfaces. 2) Analysis and Imaging of Soft Matters: based on surface analysis techniques that characterize surface and interface properties, a series of techniques are developed to analyze the structure inside soft matters directly. For ease of processing, anodic aluminum oxide (AAO) is used widely as a structure-directing template for preparing nanotubes. These processes, however, either require a vacuum apparatus or consist of filling the template with a pre-existing solid synthesized in separate steps. Another general approach to prepare nanowires is to electroplate materials inside the template after the evaporation of electrodes on the AAO template. To further simplify the preparation, a single-step direct deposition of oxides into the template under near-ambient conditions is required. Using AAO and carefully selected solution chemistry, precursor ions are adsorbed on the inner surface of the template. After in situ hydrolysis reactions, stoichiometric SrTiO3 and BaTiO3 nanowire and nanotubes are synthesized from aqueous solutions without pre-existing solids or an electric field (Inorganic Chemistry 2009, 48, 681-686). Carboxylic acid- and amine-bearing SAMs hydrolyze to carboxylate anions and ammonium cations in an electrolyte solution and yield two distinct IEP values. Similarly, thiol group deportonated and posses a low IEP. By mixing these functional groups on a substrate, the opposite charges can cancel each other out, and arbitrary IEP values of flat Au (Physical Chemistry Chemical Physics 2009, 11, 6199-6204), Au nanoparticles (Journal of Colloid and Interface Science 2009, 340, 126-130) and Si surfaces (Physical Chemistry Chemical Physics 2011, 13, 3649-3653) between the extremes defined by individual functional groups could be achieved. These zeta-potentials are measured using independent techniques of streaming potential and dynamic light scattering and can be compared. In addition, the effect of the surface chemical composition of mixed functional group on the work function is also studied (Physical Chemistry Chemical Physics 2011, 13, 4335-4339; Physical Chemistry Chemical Physics 2011, 13, 15122-15126). Zeta-potential of SAMs with mixed functional group as a function of environmental pH. Ultimate film thicknesses on binary-SAMs of various ratios in different pH environments. The quality of SAMs is affected significantly by the deposition conditions. By simply adding HCl to the deposition solution, a high quality amine-SAM is obtained. Using various surface analytical techniques, including contact angle analysis, x-ray photoelectron spectroscopy (XPS), and secondary ion mass spectrometry (SIMS), the hydrophilic amino group was found to slowly oxidize to a hydrophobic nitroso group even under ambient conditions. As a consequence, the surface potential (and hence, the isoelectric point) of the SAM surface changed significantly. These changes were monitored with an electrokinetic analyzer (Journal of Physical Chemistry C 2010, 114, 10512-10519). These changes in surface properties can be suppressed by isolating the specimen from ambient light or air indicating the degradation is a photo-oxidation process. Polysilicic acid nanodots were doped into the hole-transporting layer of an. Because of a more balanced carrier-injection, pure white light-emitting devices with up to a 3.5× higher efficiency were fabricated. To gain more knowledge of how the polysilicic nanodots (PNDs) affect the carrier transportation, the surface of the PNDs were modified with amino (Am-), vinyl (V-), and alkyl (Al-) moieties in addition to the intrinsic hydroxyl (H-) functional groups. The enhancement in device efficiency is controlled by the magnitude of surface charge and is independent to the sign of the charge and the bandgap of the light emitting dye (ACS Nano 2010, 4 4054-4060). It is known that the fabrication process affects the resultant device efficiency significantly. Contrary to general expectations, it was found that spin-coating of an emissive layer consisting of a host-guest mixture results in significant phase segregation as a function of depth. On the other hand, a thermally-evaporated layer is more homogeneous with respect to depth. Such a change in the microstructure dramatically affects the charge-injection and charge-transportation and also leads to an 3.5× difference in device efficiency (Organic Electronics 2009, 10, 459-464; Chemistry of Materials 2009, 21, 2565-2567). 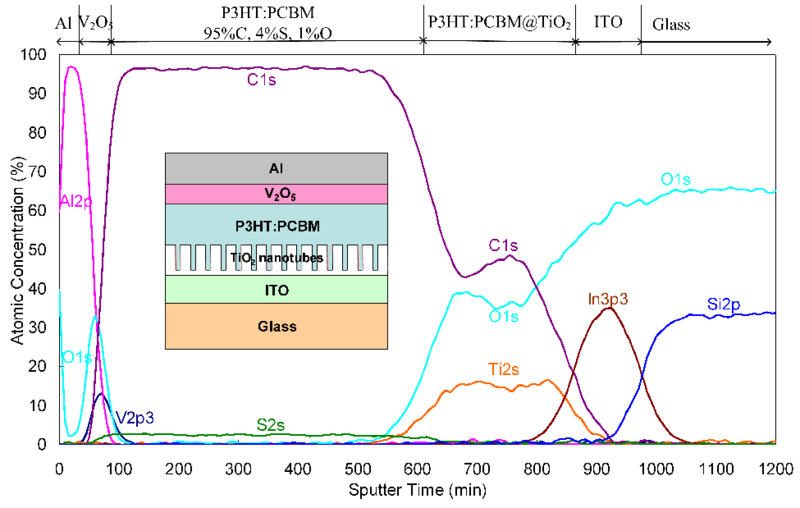 Depth profile of organic light-emitting diode device. Depth profile of inverted polymeric solar-cell. This novel analytical technique has also been used to study the degradation of an organic LED directly (Organic Electronics 2009, 10, 581-586; Organic Electronics 2011, 12, 376-382). Currently, there are no other means that can analyze the structure of a whole organic electronic operated for different times directly. In addition to the previously proposed degradation mechanisms, a new mechanism based on the direct observation of the migration of small molecules under direct current is reported. This mechanism has never been considered before and can explain the reported results. The knowledge gained in this work is crucial to the success of organic electronics with sufficient life-times for real applications. To gain high spatial resolution in 3D, the sputtering technique that provided excellent depth resolution was combined with scanning probe microscopy, which has high lateral resolution. By combining different instrumental techniques like scanning electrical potential microscopy (Analytical Chemistry 2009, 81, 8936-8941, highlighted by the journal, specimens are provided by Dr. C.-W. Chu) or force modulation microscopy (ACS Nano 2010, 4, 2547-2554), the nanostructure inside organic materials can be examined at high resolution. The fabrication parameters affect the resulting nanostructure significantly. For solar-cell devices, the phase-separation inside the bulk-heterojunction provides an adequate path for the removal of charge carriers that in turn enhance the device efficiency. On the other hand, phase-separation inside light-emitting devices is less efficient in trapping the charge carriers, which leads to efficiency drops with the development of a nanostructure. In collaboration with ULVAC-PHI, a scanning ToF-SIMS with spatial resolution of 50 nm is also demonstrated (ACS Nano 2010, 4, 833-840; Analyst 2011, 136, 716-723). Using a bulk heterojunction solar cell (specimens are provided by Prof. J.-H. Jou) as an example, the 3D molecular distribution was obtained before and after annealing. This work revealed the important relationship between fabrication conditions, nanostructure, device architecture, and device performance. Compared with established techniques like electron tomography, which can yield 3D nanostructures, the contrast generated by our technique is from direct physical properties instead of crystallinity that relates indirectly to the materials. Furthermore, ion sputtering has no physical limitations to the analyzable thickness. As a result, as long as the sample is stable to high-vacuum it can be studied in its original state without sample preparation that can introduce artifacts. Therefore our techniques are universal and more versatile than TEM-based techniques. In an apparatus based on SEM, which is relatively cheap and operates at a lower voltage (up to 30 kV), the electron interacts with the specimens more strongly and can generate better contrast, especially with light elements. 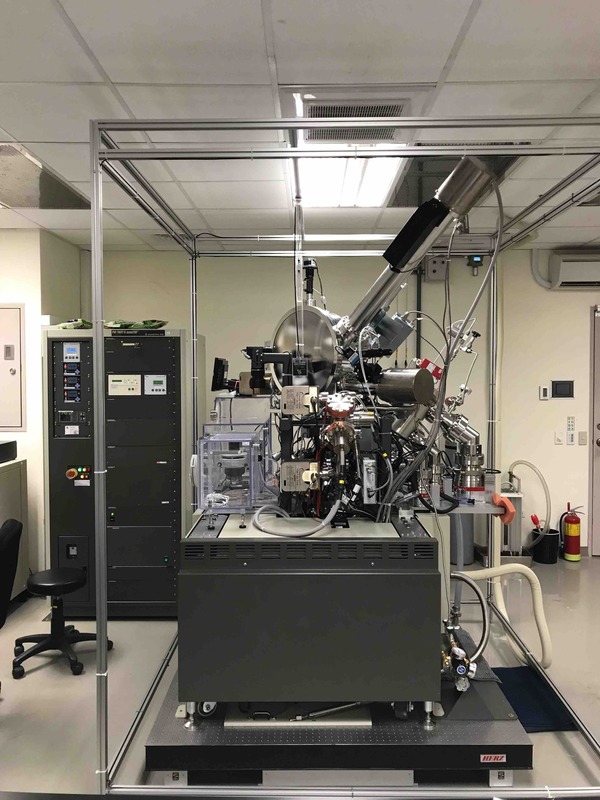 Therefore, SEM-based electron tomography is developed By using a home-made sample holder that holds a standard 3-mm TEM grid in the chamber and allows a multi-segment solid-state electron detector to be inserted behind the specimen. The 3D volume structure is then reconstructed from 2D projections acquired from the STEM using the public domain TomoJ software. A thick (1 μm) specimen of an HEK293T cell could be imaged with sufficient information to examine Au nanoparticles in the cytosol using this modified instrument (Microscopy and Microanalysis 2012, 18, 1037-1042). 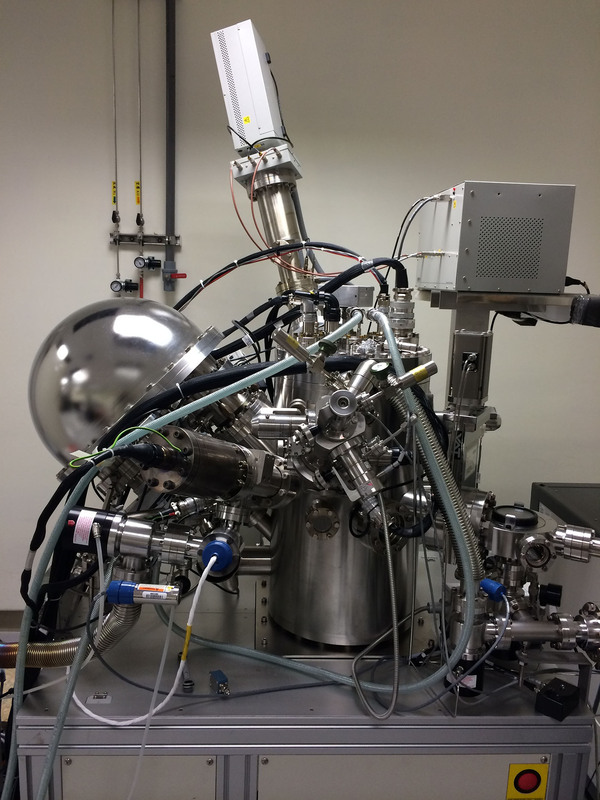 Based on an existing XPS apparatus equipped with multiple ion guns, a quadrupole mass analyzer was integrated. 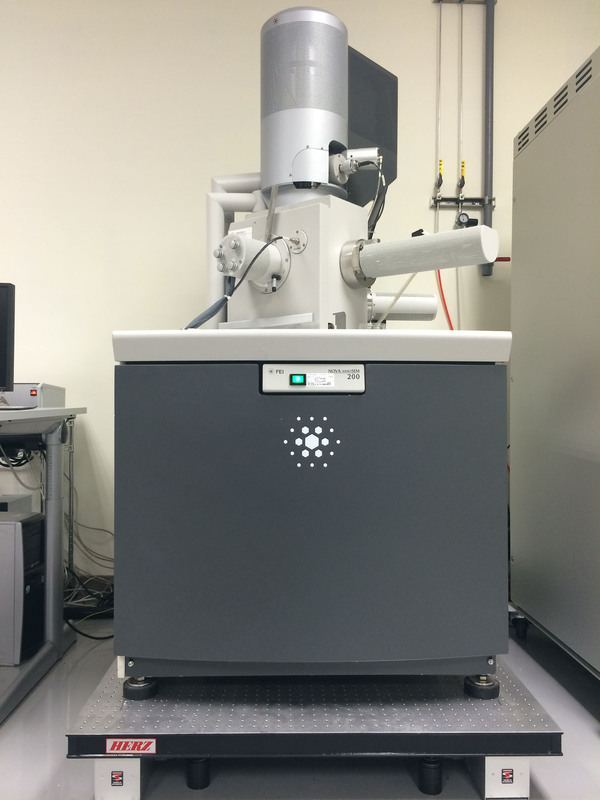 Using the originally designed XPS function, the elemental and chemical state information of remaining surface after (cluster) ion sputtering can be acquired. Using the mass analyzer concurrently during sputtering, secondary ions emitted from the specimen can be acquired at the same time (Analyst 2011, 136, 941-946; Rapid Communications in Mass Spectrometry 2011, 25, 2897-2904; Analytical Chemistry 2012, 84, 9318-9323). Using this unique system, the role of auxiliary Ar+ in C60+-Ar+ co-sputtering is studied and the auxiliary Ar+ ion is suggested to be slowly removing the deposited C. Furthermore, the interaction between these ion beams in free space is confirmed and it is found that the excessive Ar+ fluence could break C60+ and slower the over-all sputter rate. On the other hand, if the fluence of auxiliary Ar+ is insufficient, it cannot remove the deposited C effectively hence yield unsteady sputtering process. As a result, the dosage of auxiliary ion beams has to be optimized. The use of C60+ sputtering is further applied for for profiling biological materials. With the high ionization yield at high-mass regions, peptide molecular ions can be generated and detected directly, allowing for the parallel detection and quantification of multiple peptides without labeling. 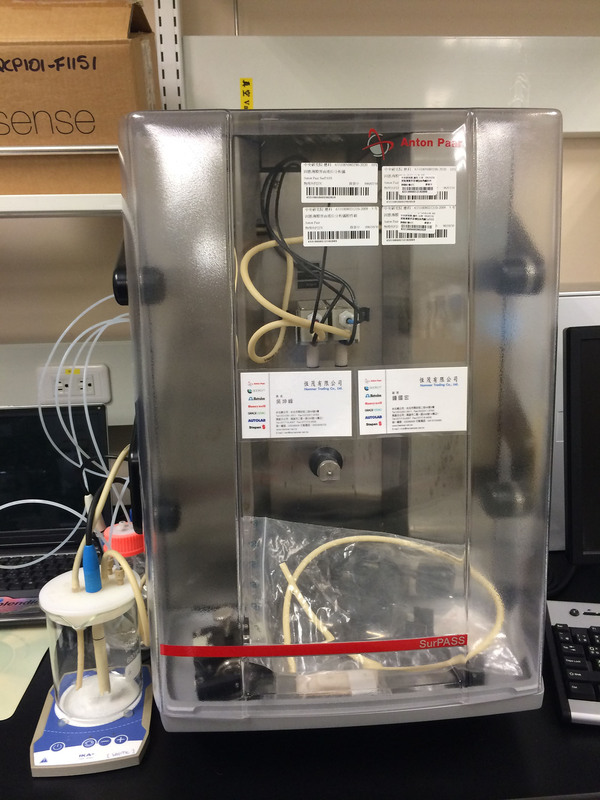 Compared to the established MALDI technique, co-ionization does not require a special matrix that contaminates the specimen, and the controlled ion-erosion process gives better depth resolution. Therefore, this co-sputtering technique is a leap forward for the parallel detection, quantification, and depth profiles of biological specimens using SIMS (Analytica Chimica Acta 2012, 718, 64-69). To further enhance the intensity of secondary ions hence increasing the sensitivity for biological species, it is found that C60+ sputtered surface oxidized quickly (Analytical Chemistry 2012, 84, 3355-3361) hence the neutralization of secondary ions is suppressed. Furthermore, by using O2+ as the auxiliary ion in the co-sputtering, molecular ion intensity increased significantly (Analytical Chemistry 2013, 85, 3781-3788). These results pave the way for successful label-free analysis of biological specimens using SIMS. In an ultra-high vacuum (UHV) chamber (10-7~10-8 Pa), photoelectrons are excited with X-ray (or vacuum UV at 20-40 eV). 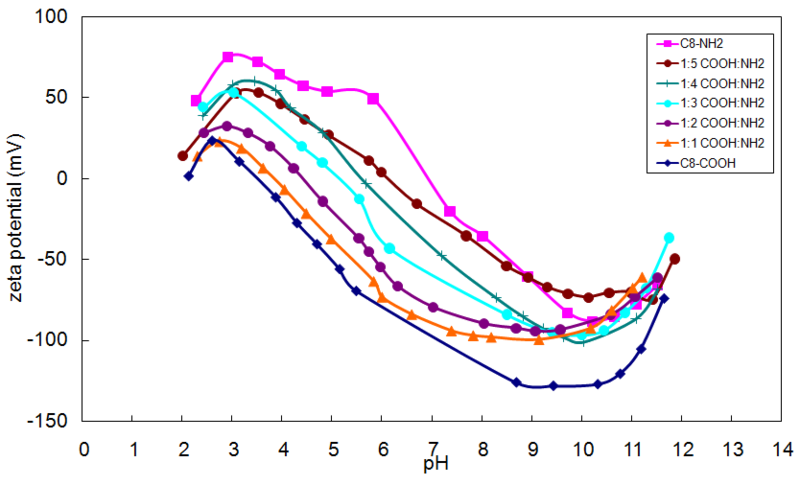 As the escape depth is shallow, the information came from the top few nm. This is important in studying the outer-most chemical composition and chemical structure of materials. Using microfocused scanning X-ray, 10-1400 µm beam size with 0.5 eV resolution can be obtained. Using He discharge VUV source, 0.125 eV resolution can be achieved. Combine with the integrated sputter gun (Ar+/O2+/Xe+ and/or C60+), one can slowly remove the surface and acquire spectra from different depth to construct the depth profile. The specimen temperature can be controlled between -120 to 500 °C during analysis. 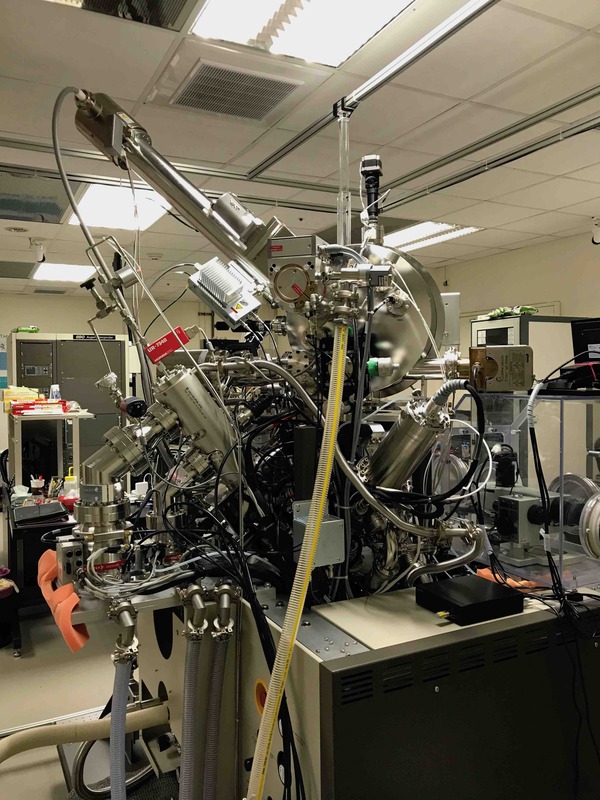 In combination with a quadrupole mass analyzer, this system also serves as a dynamic secondary ion mass spectrometer (D-SIMS) for analyzing soft materials. Based on energetic ion bombardment, secondary ions (SIs) are generated. By accelerate SIs with constant 3 kV, ions of different m/z require different times to pass a 2 m flight path and are separated. Using pulsed primary beam of low current, interaction depth of sub-monolayer can be controlled as static SIMS (S-SIMS). With TRIple Focusing Time-of-Flight (TRIFT) spectrometry, >150 µm depth of field, >±20° (up to >±90°) angular solid angle, and ~10000 m/Δm with tunable 20-240 eV pass band can be achieved. Focused Bix+ primary gun (LMIG) provides 70 nm spatial resolution and bunched operation provide best mass resolution. C60+ can also be used for generate larger molecular SI at 2 µm spatial resolution. Integrated Ar+/O2+ and Ar2500+ are also available for sputtering. With specially designed sample manipulation system, specimens can be handled at controlled atmosphere and temperature between -150 to 600 °C can be controlled during introduction and analysis. Selected secondary ion can also be diverted to a tandem linear ToF with or without collision with Ar gas for SIMS/MS analysis. To minimize the environmental interference to the high resolution work, active field canceling system (Spicer Consulting SC20) is used to control the sum of DC-5 kHz electromagnetic to be <0.07 mG and active vibration isolator (HERZ AVI-200S/M/LP) is used to support the system. Using a electron beam (0.2-30 kV), surface structures can be observed directly with nm spatial resolution. With the high-resolution low-vacuum mode, non-conducting samples can also be observed with nm resolution. Dedicate two-channel solid-state detector provides topographic or Z-contrast using back-scattered electrons. Based on stereophonic calculation and images of 2-3 tilt-angles, MeX software provides true 3D information at high resolution. The system is also modified to serve as STEM for BF/DF/HAADF operation. Combine with the X-ray Energy Dispersive Spectroscopy (XEDS, Oxford X-Max 80 mm2 Silicon Drift Detector (SDD), the chemical composition can also be determined in a manner of point-and-click. Quantitative mapping with and without standard is also available. The system also has e-beam lithography capability using Nanometer Pattern Generation System that drives scanning coils according to user designed CAD files. To provide a stable environment, active vibration isolator (HERZ AVI-200S) is used to support the microscope. Based on a 1-25 kV SEM system with <10 nm beam size, kinetic energy of emitted Auger electrons were analyzed using Cylindrical (Coaxial) Mirror Analyzer (CMA). As the escape depth is shallow, the information came from the top few nm. This is important in studying the outer-most chemical composition and chemical structure of materials. 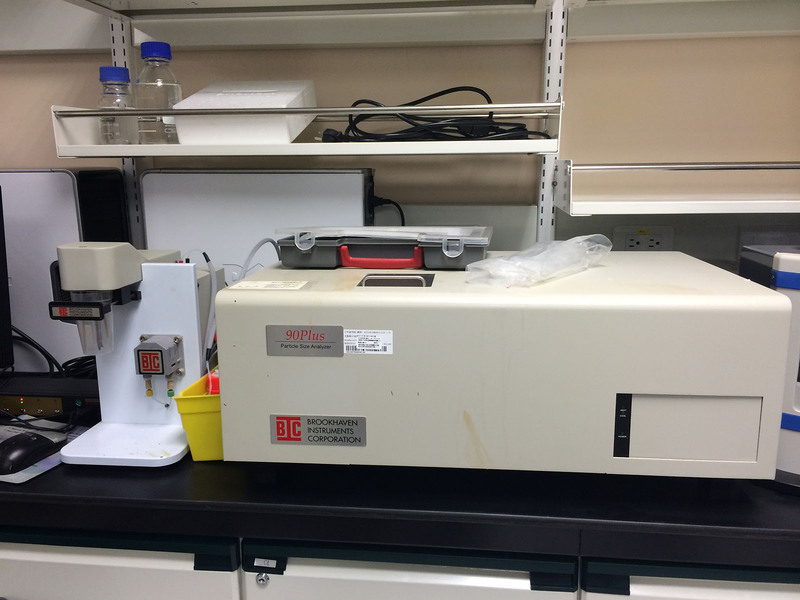 The analyzer normally operated in Fixed Retard Ratio of 0.5% and can achieve 0.05% with sample bias. Combine with the integrated Ar+ sputter gun, one can slowly remove the surface and acquire spectra from different depth to construct the depth profile. The low energy ion can also be used to alleviate the charge-up effect on insulating samples. An in situ cryogenic fracture mechanism is also available to prepare fresh surface for analysis. Using a varity of probes, a wide range of surface chemical, physical, mechanical, and electrical properties can be studied with high spatial resolution (<nm). The usual operation modes include scanning tunneling microscopy (STM); atomic force microscopy (AFM) at contact, tapping, phase image, conductive, and lift mode; force curve (with k-calibration); I-V curve; lateral force microscopy (LFM); chemical force microscopy (CFM); magnetic force microscopy (MFM); electric force microscopy (EFM); Kelvin probe microscopy (KFM, a.k.a. scanning electric potential microscopy, SEPM); Piezo-Response Microscopy (PRM). The sample can be under air or immsered in liquids using the fluid cell. The system is sitting on a Halcyoncs Micro 40 active vibration isolation platform. The vibration level on the surface is better than 5 dB at <10 Hz and <0 dB for higher frequencies. By measuing the change in freqiency of a quartz crystal resonator, mass change per unit area can be measured down to 1 ng/Hz-cm2. In addition to frequency, energy dissipation can also be measured to study the rigidity of deposited film. By using high-order overtones, the system is more stable in liquid environments and provide viscoelastic properties of the film. An optical/fluoresce microscopy (Olympus BX51) with Differential Interference Contrast is integrated for concurrent observation. 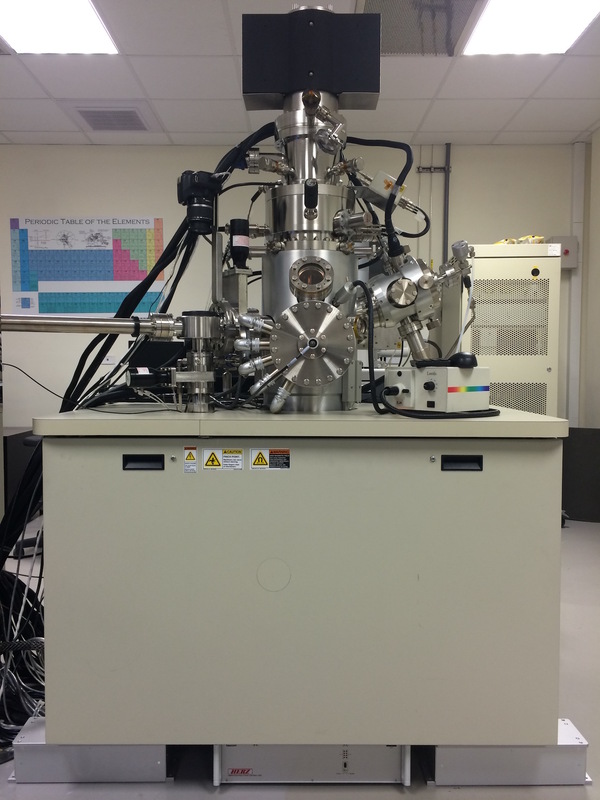 The instrument is used for measuring the zeta-potential of bulk materials and is complementary to DLS. This zeta-potential is important to predict the stability if colloidal suspensions and the tendency to agglomerate. Based on the dynamic light scattering (DLS), this instrument can be used to determine the particle size and its zeta-potential. For polymers, the distribution of molecular weight can also be determined in static light scattering (SLS) mode. 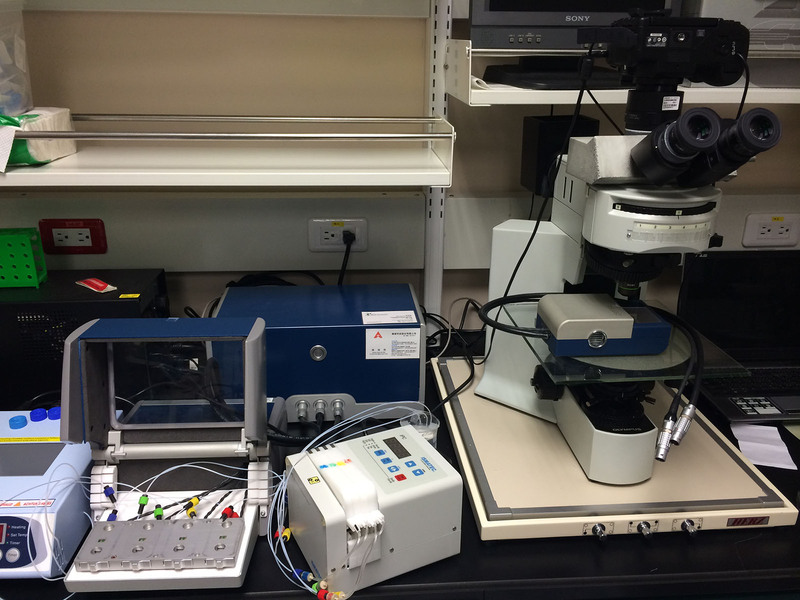 Comparing with the electro-kinetic analyzer (EKA) like the SurPASS, this instrument is mainly for nano materials. 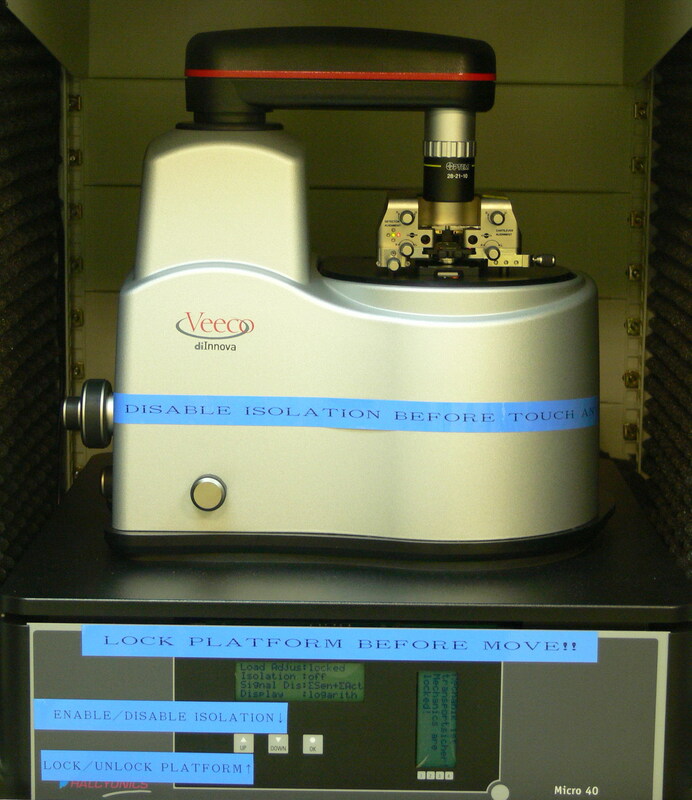 Comparing with observing the particle size directly with electron microscopes, DLS is quick and non-destructive. 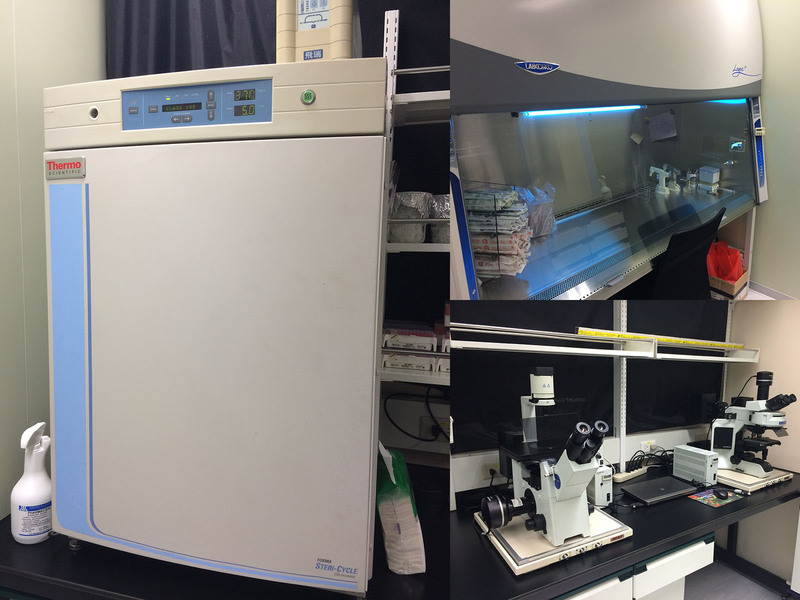 The P2 level (NSF49 approved) cell culture room is equipped with direct-heat CO2 incubator, and optical microscopes with CCD to obtain transmissive/reflective bright-field/fluorescent/phase-contrast images. This is for high-performance computing. The main system consists with 48 computing nodes. Each node has two dual-core 3GHz Woodcrest CPU and 8-32Gb fully-buffered memory. Jwo-Huei Jou,* Wei-Ben Wang, Mao-Feng Hsu, Jing-Jong Shyue,* Chuan-Huan Chiu, I-Ming Lai, Sun-Zen Chen, Po-Shien Wu, Cheng-Chung Chen, Chi-Ping Liu, and Shih-Ming Shen "Extraordinarily High Efficiency Improvement for OLEDs with with High Surface-Charge Polymeric Nano-Dots" ACS Nano 4  4054-4060 (2010). [DOI: 10.1021/nn100357m] Highlighted by NPG Asia Materials. Tien-Min Yuan, Yu-Tsai Hsieh, Sue-Min Yeh, Jing-Jong Shyue, and Tien-Yau Luh* "Tunable C2-Chiral 1,2-Diols. Syntheses of 1,4-Bis-Alkoxybutane-2S,3S-diols" SYNLETT 53-55 (1996). Kwang-Ming Lee, Jing-Jong Shyue, Sarah Y. Chang, Thomas C. Yang "Excitation-Dependent Fluorescent Organic Nanoparticles" United States Patent US2015/0064799 A1 (2015/3/5). Kwang-Ming Lee, Jing-Jong Shyue, Sarah Y. Chang, Thomas C. Yang "Excitation-Dependent Fluorescent Organic Nanoparticles" Taiwan Patent TW201508046A (2015/3/1). Jing-Jong Shyue and Mark R. De Guire*, "Deposition of Titanium-Vanadium Oxide Films on Organic Self-Assembled Monolayers," Trans. MRS-J 29  2383-2386 (2004). Proceedings of IUMRS-ICAM 2003 (8th International Conference on Advanced Materials), Yokohama, Japan, October 8-13, 2003. Jing-Jong Shyue and Mark R. De Guire*, "Designing Substrates for Bioinspired Processing of Vanadium Oxide Hydrate (V2O5 nH2O) Thin Films," Advances in Science and Technology 31 469-480 (2003). Proceedings of CIMTEC 2002 (10th International Ceramics Congress and 3rd Forum on New Materials), Florence, Italy, July 14-18, 2002, P. Vincenzini, ed. "Depth Profiling of Soft Materials with Cluster-Atomic Ion Co-Sputter", Taipei Medical University, October 10 2016. "Effect of Surface Potential on Protein Adsorption and Cell Behaviors", 4th QCM-D Scientific Conference, South China University of Technology, November 9 2015. "Surface Analysis with in situ Cluster-Ion Sputtering for Analyzing the Structure Inside Organic Electronics", 2014 Taiwan-Japan Symposium of Frontier Research on Applications of Organometallics and Atomic Layers, National Taipei University of Technology and Grand-in-Aid "Science of Atomic Layers" MEXT (Japan), December 27 2014. "Correlative Microscopy", The Hebrew University of Jerusalem, Israel-Academia Sinica Bilateral Workshop on Nanoscience and Nanotechnology, Academia Sinica, November 15 2013. "Molecular Secondary Ion Mass Spectrometry for Label-Free 3D Imaging of Soft Maters", Insitude of Biotechnology in Medicine, Department of Biotechnology and Laboratory Science in Medicine, National Yang-Ming University, November 07 2013. "Nanoscale Imaging and Analysis of Soft Materials using Cluster Ion Beam", Department of Chemistry, National Kaohsiung Normal University, 18 March 2013. "Scanning Ion Microscopy", Institute of Cellular and Organismic Biology, Academia Sinica, 5 February 2013. "Nanoscale Imaging and Analysis of Organic Electronic Devices Using Cluster Ion Beam", Department of Materials Science and Engineering, Feng Chia University, 19 December 2012. "Nanoscale Imaging and Analysis of Organic Electronic Devices Using Cluster Ion Beam", Department of Chemistry, Soochow University, 21 November 2012. "High Speed EDS Elemental Mapping: Silicon Drift Detectors with High Solid Angle", Taiwan Vacuum Society, 10 August 2012. "Molecular Secondary Ion Mass Spectrometry for Label-Free 3D Imaging of Soft Maters", Nano Project, Academia Sinica, 27 April 2012. 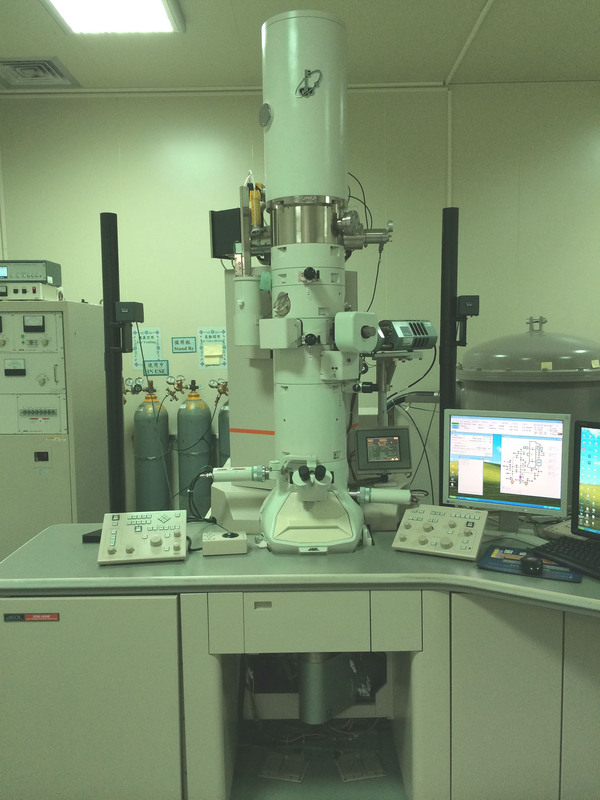 "Nanoscale Imaging and Analysis of Organic Electronic Devices Using Cluster Ion Beam", Institute of Atom and Molecular Sciences, Academia Sinica, 15 March 2012. 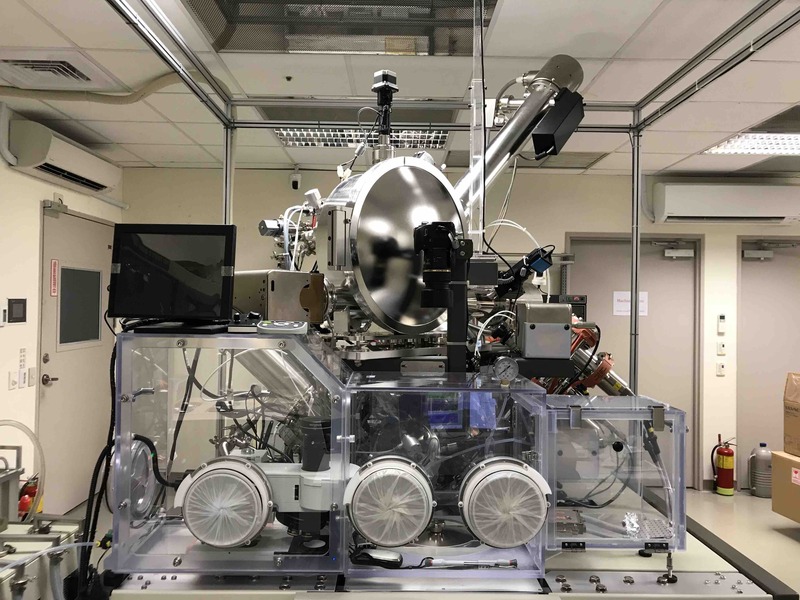 "Nanoscale Imaging and Analysis of Organic Electronic Devices Using Cluster Ion Beam", Center for Condensed Matter Sciences, National Taiwan University, 5 December 2011. "Molecular Migration Behaviors in Organic Light-Emitting Diodes with Different Host Structures", Asian Conference on Organic Electronics (A-COE) 2011, 5 November 2011. "Adsorption of Plasmid DNA on the Binary Self-Assembled Monolayers Modified QCM Chip", QCM-D Scientific World Tour 2011, 20 October 2011. "Nanoscale Imaging and Analysis of Organic Electronic Devices Using Cluster Ion Beam", Department of Materials Science and Engineering, National Dong Hua University, 21 June 2011. "Nanoscale Imaging and Analysis of Organic Electronic Devices Using Cluster Ion Beam", Department of Materials Science and Engineering, National Central University, 25 June 2011. "Nanoscale Imaging and Analysis of Organic Electronic Devices Using Cluster Ion Beam", Asian Conference on Organic Electronics (A-COE) and Asian Symposium on Organic Materials for Electronics and Photonics (ASOMEP), 5 November 2010. "Nanoscale Imaging and Analysis of Organic Electronic Devices Using Cluster Ion Beam", Department of Chemistry, National Tamkang University, 14 June 2010. "Nanoscale Imaging and Analysis of Organic Electronic Devices Using Cluster Ion Beam", Progress in Electromagnetics Research Symposium, 23 March 2010. "Nanoscale Imaging and Analysis of Organic Electronic Devices Using Cluster Ion Beam", Institute of Applied Mechanics, National Taiwan University, 28 September 2009. "Analysis of Organic Electronics using X-ray Photoelectron Spectrometry with in situ C60+and Ar+ Co-Sputtering", Taiwan and Japan bilateral conference: Current Status and Development of Surface Characterization in Nanotechnology and Materials Research, 1-2 December 2008. "Depth profiling of Organic Films using mixed C60+and Ar+ Ion-Sputtering", Department of Materials Science and Engineering, National Sun Yat-sen University, 15 October 2008. "Depth Profiling of Organic Electronics using C60+and Ar+ Co-Sputtering", in Taiwan-Japan Symposium on Surface-Interface Science and Nano-Soft Material, 7-10 August 2008. "XPS Depth-Profiling of Organic Multilayer Thin-Films", 2008 ULVAC-PHI Technical Symposium, 2-6 June 2008. "Depth profiling of Organic Films using mixed C60+and Ar+ Ion-Sputtering", National Chung Hsing University, 10 April 2008. "Depth profiling of Organic Films using mixed C60+and Ar+ Ion-Sputtering", National Dong Hua University, 10 March 2008. "XPS Depth-Profiling of Organic Multilayer Thin-Films", Surface Analysis Users' Club, 28 June 2007. "Aqueous Synthesis of Nanostructured Oxides and Their Properties", National Kaohsiung Normal University, 20 May 2007. "Template-Directed Synthesis of Oxide Titania Nanowires and Nano-Tubes Using Aqueous Precursors", Academia Sinica, Taiwan, 18 October 2006. "Transmission Electron Microscopy: Theories and Applications (a short course to TEM and HREM)", Department of Chemistry, National Taiwan University, 11 July 2006. "Template-Directed Synthesis of Oxide Titania Nanowires and Nano-Tubes Using Aqueous Precursors", Department of Chemistry, National Taiwan University, Taiwan, 6 June 2006. "Soft Solution Processes for Functional Nano-materials ", Center for Condensed Matter Sciences, National Taiwan University, Taiwan, 29 September 2005. "Soft Solution Processes for Functional Nano-materials ", Research Center for Applied Sciences, Academia Sinica, Taiwan, 22 April 2005. "Bio-inspired Solution Processes for Functional Nano-materials ", Department of Chemical Engineering, National Tsing Hua University, Taiwan, 22 April 2005. "Introduction to Chemical and Instrument Database", Department of Chemistry, National Taiwan University, Taiwan, 21 April 2005. 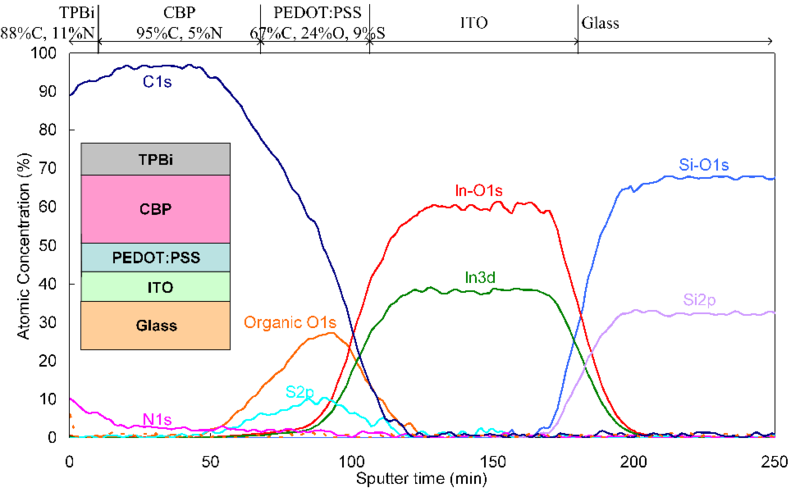 "Titanium-Vanadium Oxide Materials", Department of Materials Science and Engineering, Case Western Reserve University, Cleveland, Ohio, 30 November 2004. "Deposition of Titanium-Vanadium Oxide Materials from Aqueous Solutions via Co-deposition", Department of Chemistry, National Taiwan University, Taiwan, 29 July 2004. "Organic Self-Assembled Monolayers on Silicon Substrates: In-situ Transformations, Properties, and Applications", in Department of Chemistry, Academia Sinica, Taiwan, 26 July 2004. "Nano Technologies", in division 3480, International Rotary Club of Yung Ho East, Taiwan, 21 July 2004. "Recent Developments on Self-Assembled Monolayers (SAMs) at Case Western Reserve University," in Department of Applied Chemistry, Nagoya University, Japan, October 2003. "Introduction to Internationalization Applications Chinese Localization Project," in Open Source Workshop 2000, Academia Sinica, Taiwan, July 2000. Yi-Wei Lee, Wei-lun Kao, Hsun-Yun Chang and Jing-Jong Shyue "Quartz Crystal Microbalance with Dissipation (QCM-D) Study of Bacterial Attachment Process on Surfaces of Different Hydrophilicity" in 253rd ACS National Meeting, San Francisco, California, 2 April 2017. Shin-Kung Wang, Yi-Hsuan Chu, Hsun-Yun Chang and Jing-Jong Shyue "Effect of Energy per Atom (E/n) in Ar Gas Cluster Ion Beam (GCIB, Arn+) and O2+ Cosputter" in 253rd ACS National Meeting, San Francisco, California, 2 April 2017. Wei-Chun Lin,* Hsun-Yun Chang, Kevin Abbasi, Jing-Jong Shyue and Clemens Burda "3-Dimensional In-Situ ToF-SIMS Imaging of Perovskite Films Under Controlled Humidity Environmental Conditions" in 2016 MRS-Spring Meeting, Phoenix, Arizona, 29 March 2016. Wei-Chun Lin,* Lili Wang, Yun-Wen You, Jing-Jong Shyue and Clemens Burda "Observation of CH3NH3PbI3 Diffusion into the Titania Layer During Operation of Perovskite Solar Cells" in 2016 MRS-Spring Meeting, Phoenix, Arizona, 29 March 2016. Yun-Wen You,* Hsun-Yun Chang, Wei-Lun Kao, Chen-Yi Wu, Yu-Hsuan Lee and Jing-Jong Shyue "Effect of Cluster Size and Energy of Argon Gas Cluster Sputter Yields on the Depth Profiling of Organic Light-Emitting Devices" in 251st ACS National Meeting, San Diego, California, 13 March 2016. Chen-Yi Wu,* Wei-Lun Kao, Hsun-Yun Chang, Kuo-Jui Chu and Jing-Jong Shyue "Coupling Paper-Based Micro-Fluidic Separation Devices and Time-of-Flight Secondary Ion Mass Spectroscopy for Analyzing Molecular Mixtures" in 251st ACS National Meeting, San Diego, California, 13 March 2016. Wei-Lun Kao,* Hsun-Yun Chang, Jiun-Hao Lin and Jing-Jong Shyue "Revealing the Effect of Zeta Potential in Cell Secreted Extracellular Matrix with Time-of-Fight Secondary Ion Mass Spectrometry" in 251st ACS National Meeting, San Diego, California, 13 March 2016. Yi-Hsuan Chu,* Hsun-Yun Chang, Wei-Lun Kao, Kuo-Jui Chu and Jing-Jong Shyue "Enhancement of Molecular-Ion Intensity by Ar2500+-O2+ Cosputtering for Depth Profiling of Soft Materials in Secondary Ion Mass Spectrometry" in 249th ACS National Meeting, Denver, Colorado, 24 March 2015. Kuo-Jui Chu,* Hsun-Yun Chang, Wei-Lun Kao, Yi-Hsuan Chu and Jing-Jong Shyue "High-Throughput Parallel Detection and Quantification of Peptides with Paper-Based Microarray and Molecular Time-of-Flight Secondary Ion Mass Spectrometry (ToF-SIMS)" in 249th ACS National Meeting, Denver, Colorado, 24 March 2015. Hsunyun Chang* and Jing-Jong Shyue "3D Molecular Imaging of HEK293T Cell with Internalized Gold Nanoparticles using ToF-SIMS" in 249th ACS National Meeting, Denver, Colorado, 24 March 2015. Wei-Lun Kao,* Hsunyun Chang and Jing-Jong Shyue "Dynamic Observation of NIH3T3 Cells Adhesion Behaviors on Binary Self-Assembled Monolayers Modified Gold Surfaces" in 249th ACS National Meeting, Denver, Colorado, 22 March 2015. Yu-Ting Kuo* and Jing-Jong Shyue "Effect of Surface Potential on Cell Adhesion and Profliferation" in 247th ACS National Meeting, Dallas, Texas, 16 March 2014. Wei-Lun Kao* and Jing-Jong Shyue "Dynamic Observation of Cell Adhesion Behaviors on Binary Self-Assembled Monolayers Modified Gold Surfaces with Tunable Surface Potential" in 247th ACS National Meeting, Dallas, Texas, 16 March 2014. Jiun-Hao Lin* and Jing-Jong Shyue "Effect of Surface Potential on the Adsorption of Proteins" in 246th ACS National Meeting, Indianapolis, Indiana, 9 September 2013. Hua-Yang Liao* and Jing-Jong Shyue "Enhancing the Sensitivity of Molecular Secondary Ion Mass Spectrometry with C60+-O2+ Cosputtering" in 246th ACS National Meeting, Indianapolis, Indiana, 8 September 2013. Chih-Chieh Huang,* Hsun-Yun Chang and Jing-Jong Shyue "Regulation of Cell Behaviors by Binary Self-Assembled Monolayers Modified Gold Surface" in 2013 MRS-Spring Meeting, San Francisco, California, 3 April 2013. Hsun-Yun Chang* and Jing-Jong Shyue "Binary self-Assembled Monolayers Modified AuNPs as Carriers in Biological Applications" in 2013 MRS-Spring Meeting, San Francisco, California, 3 April 2013. Hsueh-Chung Liao,* Meng-Huan Jao, Po-Hsuen Chen, Jing-Jong Shyue, Yang-Fang Chen and Wei-Fang Su "Facile Synthesis of Wurtzite Copper-Zinc-Tin-Sulfide Nanocrstals from Plasmonic Djurleite Nuclei" in 2013 MRS-Spring Meeting, San Francisco, California, 5 April 2013. Meng-Hung Tsai* and Jing-Jong Shyue "Effect of specimen temperature on C60+-Ar+ co-sputtering of polymers" in 243rd ACS National Meeting, San Diego, 25 March 2012. Hua-Yang Liao* and Jing-Jong Shyue "Dramatically enhanced oxygen uptake and ionization yield with C60+ sputtering" in 243rd ACS National Meeting, San Diego, 25 March 2012. Hsun-Yun Chang,* Yun-Wen You, Hua-Yang Liao, Meng-Hung Tsai and Jing-Jong Shyue "Binary self-assembled monolayers modified Au nanoparticles as carriers in biological applications" in 243rd ACS National Meeting, San Diego, 27 March 2012. Chun-Hsien Chen,* Jay Shieh, Chao-Sung Lin, Jing-Jong Shyue "Photocatalytic behaviors of TiO2-SrTiO3 composite thin film and nanostructure" in ASME 2011 Conference on Smart Materials, Adaptive Structures and Intelligent Systems, Scottsdale, Arizona, 21 September 2011. Guo-Ji Yen,* Hsun-Yun Chang, Yun-Wen You, Wei-Chun Lin, Chia-Yi Liu, Che-Hung Kuo, Szu-Hsian Lee, Wei-Lun Kao, Chi-Ping Liu, Chi-Jen Chang, Chih-Chieh Huang, Mong-Hong Tsai, Jing-Jong Shyue "Interactions between Binary Self-Assembled Monolayer-Modified AFM Probes and Plasmid DNA in Aqueous Environments" in 2011 MRS-Spring Meeting, San Francisco, California, 26 April 2011. Hsun-Yun Chang,* Yun-Wen You, Wei-Lun Kao, Guo-Ji Yen, Chi-Jen Chang, Jing-Jong Shyue "Binary Self-assembled Monolayers Modified Au Nanoparticles as Carriers in Biological Applications" in 2011 MRS-Spring Meeting, San Francisco, California, 26 April 2011. Chi-Jen Chang,* Hsun-Yun Chang, Yun-Wen You, Wei-Lun Kao, Guo-Ji Yen, Meng-Hung Tsai, Jing-Jong Shyue "Parallel Detection and Quantification of Thin-film Peptides with Dynamic-secondary Ion Mass Spectrometry (D-SIMS) Excited by C60+-Ar+ Co-sputtering" in 2011 MRS-Spring Meeting, San Francisco, California, 27 April 2011. Yun-Wen You,* Hsun-Yun Chang, Wei-Lun Kao, Guo-Ji Yen, Chi-Jen Chang, and Jing-Jong Shyue "Tree-dimension Imaging of Fibroblast Cells by Scanning Transmission Electron Microscopy with Various Tilting Angles" in 2011 MRS-Spring Meeting, San Francisco, California, 28 April 2011. Yun-Wen You, Hsun-Yun Chang, Wei-Chun Lin, Chi-Jen Chang, and Jing-Jong Shyue* "Molecular Dynamic-secondary Ion Mass Spectrometry (D-SIMS) Excited by C60+-Ar+ Co-ionization" in 2011 MRS-Spring Meeting, San Francisco, California, 29 April 2011. Chia-Yi Liu,* Bonnie Yu, Wei-Chun Lin, Wei-Ben Wang, I-Ming Lai, Che-Hung Kuo, Szu-Hsian Lee, Wei-Lun Kao, Guo-Ji Yen, Yun-Wen You, Hsun-Yun Chang, Chi-Ping Liu, Jwo-Huei Jou, Jing-Jong Shyue, "Effect of Fabrication Parameters on Three-dimensional Nanostructures and Device Efficiency of Polymer Light Emitting Diodes", in 2010 MRS-Spring Meeting, San Francisco, California, 8 April 2010. Chi-Ping Liu,* Wei-Chun Lin, Wei-Ben Wang, Chia-Yi Liu, Jwo-Huei Jou, Jing-Jong Shyue, "Highly Stable Organic Light-emitting Diodes by Using High Stereo-hindrance Host Material as Blockade", in 2010 MRS-Spring Meeting, San Francisco, California, 8 April 2010. Che-Hung Kuo,* Bang-Ying Yu, Guo-Ji Yen, Wei-Chun Lin, Wei-Ben Wang, I-Ming Lai, Szu-Hsian Lee, Wei-Lun Kao, Chia-Yi Liu, Yun-Wen You, Hsun-Yun Chang, Chi-Ping Liu, Jwo-Huei Jou, and Jing-Jong Shyue, "Effect of Nanoscale Phase Separation on the Efficiency of Polymeric Light Emitting Diodes Studied with Scanning ToF-SIMS", in 2010 MRS-Spring Meeting, San Francisco, California, 7 April 2010. Hsun-Yun Chang,* Yun-Wen You, Yu-Chin Lin, Wei-Chun Lin, Chia-Yi Liu, Che-Hung Kuo, Szu-Hsian Lee, Wei-Lun Kao, Guo-Ji Yen, Chi-Ping Liu, Jing-Jong Shyue, "The Cytotoxicity of Au Nanoparticales Modified With Self-assembled Monolayers With Mixed-functional Groups to Living Cells", in 2010 MRS-Spring Meeting, San Francisco, California, 7 April 2010. Szu-Hsian Lee,* Wei-Chun Lin, Che-Hung Kuo, Bonnie Yu, Wei-Lun Kao, Guo-Ji Yen, Chia-Yi Liu, Yun-Wen You, Hsun-Yun Chang, Chi-Ping Liu, Jing-Jong Shyue, "ToF-SIMS Study of Photo-oxidation of NH2 Self-assembled Monolayers on Gold Substrate", in 2010 MRS-Spring Meeting, San Francisco, California, 6 April 2010. Wei-Chun Lin,* Bonnie Yu, Che-Hung Kuo, Wei-Ben Wang, Szu-Hsian Lee, Wei-Lun Kao, Guo-Ji Yen, Chia-Yi Liu, Yun-Wen You, Hsun-Yun Chang, Chi-Ping Liu, Jwo-Huei Jou, Jing-Jong Shyue, "Three-dimensional Nanostructure of Bulk-heterojunction Imaged by Scanning Electrical Potential Microscopy and High-resolution Scanning Time-of-Flight Secondary Ion Mass Spectrometry", in 2010 MRS-Spring Meeting, San Francisco, California, 6 April 2010. Yun-Wen You,* Hsun-Yun Chang, Wei-Chun Lin, Bonnie Yu, Che-Hung Kuo, Szu-Hsian Lee, Chia-Yi Liu, Wei-Lun Kao, Guo-Ji Yen, Chi-Ping Liu, Jing-Jong Shyue, "Three-dimension Imaging of Fibroblast Cells by Scanning Probe Microscope with Cluster Ion Slicing", in 2010 MRS-Spring Meeting, San Francisco, California, 6 April 2010. Yu-Chin Lin,* Bang-Ying Yu, Wei-Chun Lin, Ying-Yu Chen and Jing-Jong Shyue, "Site-Selective Deposition of Gold on Photo-Patterned Self-Assembled Monolayers", in 2008 MRS-Spring Meeting, San Francisco, California, 26 March 2008. Jung-Hui Wang, Bang-Ying Yu, Ying-Yu Chen and Jing-Jong Shyue,* "Stable Titanium (III) Enriched Catalysts", in 2008 MRS-Spring Meeting, San Francisco, California, 26 March 2008. Bang-Ying Yu, Ying-Yu Chen,* Szu-Ying Tsai, Chih-Wei Chu, Wei-Chun Lin, Yu-Chin Lin and Jing-Jong Shyue, "Ordered TiO2 Nanotube Array in Polymer Solar Cells", in 2008 MRS-Spring Meeting, San Francisco, California, 26 March 2008. Wei-Chun Lin,* Bang-Ying Yu, Ying-Yu Chen, Yu-Chin Lin and Jing-Jong Shyue, "Tuning Surface Potential with Mixed Self-Assembled Monolayers", in 2008 MRS-Spring Meeting, San Francisco, California, 25 March 2008. Jwo-Huei Jou, Wei-Ben Wang,* Mao-Feng Hsu, Jing-Jong Shyue, He Wang. "Small Polymeric Nano-Dot Enhanced Pure-White Organic Light Emitting Diode", in Organic Electronics Conference and Exhibition 2007, Frankfurt, Germany, 25 September 2007. Bang-Ying Yu,* Jing-Jong Shyue, Yen-Yu Chen, Ju-Yu Tsai, In-Hyuck Song, Hai-Doo Kim, Sheng-Chang Wang, and Wen-Cheng Jimmy Wei "High Temperature Porous Al2O3 Filter in Gradient Structure-Tabular Al2O3 Formation on Porous Alumina Substrate", in EUROMAT 2007 (European Congress on Advanced Materials and Processes), Nunberg, Germany, 10-13 September 2007. John Moulder,* Sankar Raman, Johm Hammond, Noriaki Sanada, Ann Belu, Jing-Jong Shyue, "XPS Sputter Depth Profiling and Surface Cleaning with C60 Sputter Ion Beams", 12th European Conference on Applications of Surface and Interface Analysis, Brusseks, Flagey, 9 September 2007. Jason S Tresback,* Alexander L Vasiliev, Jing-Jong Shyue and Nitin P Padture, "Metal-Oxide-Metal (MOM) Heterojunction Nanowires for Chemical-Sensor Devices", in 2006 MRS-Spring Meeting, San Francisco, California, 20 April 2006. Rebecca E. Cochran,* Jing-Jong Shyue and Nitin Padture, "Synthesis of Metal Oxide Nanotubes and Nanowires by Liquid Phase Deposition", in the Ohio Nanotechnology Summit, Columbus, Ohio, 4 April 2006. Edward D. Herderick,* Alexander L. Vasiliev, Jing-Jong Shyue and Nitin Padture, "Synthesis of Au-TiOx-Au Metal-Oxide-Metal (MOM) Heterojunction Nanowires", in the Ohio Nanotechnology Summit, Columbus, Ohio, 4 April 2006. Jing-Jong Shyue,* Rebecca E. Cochran and Nitin Padture, "Template-Directed Synthesis of Titania Nanowires and Nano-Tubes Using Aqueous Precursors at Near-Ambient Temperature", in 2005 MRS-Fall Meeting, Boston, Massachusetts, 28 November 2005. Jing-Jong Shyue* and Nitin Padture, "Template-Directed and SAM-Mediated Synthesis of Au-TiO2-Au Heterojunction Nanowires", in 2005 MRS-Fall Meeting, Boston, Massachusetts, 29 November 2005. Jing-Jong Shyue and Mark R. De Guire*, "Nanostructured, Mesoporous Titanium-Vanadium Oxide: Fabrication and Catalytic Performance", in Nano Research Symposium, Cleveland, Ohio,17 February 2004. Jing-Jong Shyue* and Mark R. De Guire, "Deposition of Titanium-Vanadium Oxide Films on Organic Self-Assembled Monolayers", in Soft-Solution Processing 2003, International Union of Materials Research Society-International Conference on Advanced Materials 2003, Yokohama, Japan, 8-13 October 2003. Jing-Jong Shyue, Yin Tang and Mark R. De Guire*, "Particle-Surface Interactions Mediated by Organic Self-Assembled Monolayers", in Particles 2003 Conference on Imaging, Marking and Printing Applications of Particle Technology, Toronto, Canada, 23-26 August 2003. Jing-Jong Shyue* and Mark R. De Guire, "Forces between Nitrogen-Containing Self-Assembled Monolayers (SAMs) and Zirconia Particles in Aqueous Solutions", in 105th Annual Meeting of the American Ceramic Society, Nashville, Tennessee, 27-30 April 2003. Jing-Jong Shyue* and Mark R. De Guire, "Selective Deposition of Vanadia and Titania Films on Self-Assembled Organic Monolayers (SAMs)", in 105th Annual Meeting of the American Ceramic Society, Nashville, Tennessee, 27-30 April 2003. Jing-Jong Shyue, Yin Tang, and Mark R. De Guire,* "Nanoscale Measurements of Forces between Ceramics and Model Surfaces" in Symposium on Structure at the Limit of Resolution: A Symposium to Celebrate Manfred Ruehle's 65th Birthday at the 105th Annual Meeting & Exposition of the American Ceramic Society, Nashville, Tennessee, 27-30 April 2003. Jing-Jong Shyue* and Mark R. De Guire, "Aqueous Deposition of Vanadium Oxide on Different Self-Assembled Organic Monoalyers", in the 104th Annual Meeting of American Ceramic Society, St. Louis, Missouri, 1 May 2002. Jing-Jong Shyue and Mark R. De Guire*, "Functionalized Organic Substrates for Titania and Vanadia Thin Films", in Workshop on "Bioinspired Approaches for Advanced Materials," Schloss Ringberg, Tegernsee, Germany, 13 March 2002. Mark R. De Guire,* Jing-Jong Shyue, Hillel Pizem, and Chaim N. Sukenik, "Designing Substrates for Bioinspired Processing of Ceramic Thin Films" , in CIMTEC 2002 (10th International Ceramics Congress and 3rd Forum on New Materials), Florence, Italy, 14-18 July 2002.